The HP EliteBook 8570w carries over the design language HP introduced with their 8x60 refresh, and it's a very sound one. The old 8740w was, frankly, a pretty hideous tricolor mish-mash of different styles that didn't go together well. While I'd like to see HP refresh and refine this design a bit more, it definitely still has legs. 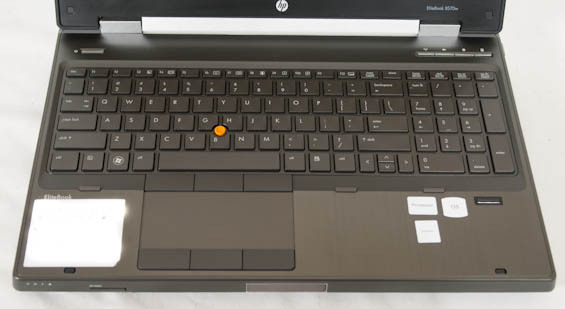 For this, one of HP's top-of-the-line enterprise notebooks, it starts with a gunmetal-colored aluminum lid with an illuminated HP logo when the system is powered on. There's a strip of plastic along the top for the antennas colored to match the rest of the lid, and then the hinges of the notebook are silver. 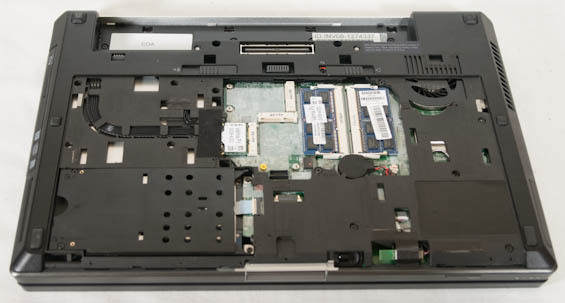 It bears mentioning that HP reinforces the hinges of the notebook with a bar built into them, and the hinge itself is incredibly sturdy and not the least bit prone to wobbling. Pressing the latch and opening the 8570w reveals a black matte plastic bezel for the display along with the gunmetal-colored brushed aluminum interior surface. The white LED backlit chiclet keyboard is the same color. It's my understanding the keyboard was a point of contention in my review of the M6700 (among other things), but I'm still adamant that this more standardized layout is much more ideal. The keys themselves are responsive with no flex, but HP's double-high left and right arrow keys, while aesthetically appealing, still feel odd. HP makes good use of the available real estate in the palm rest for a sizable touchpad with a smooth, very pleasing finish. Above and below it are the trio of dedicated mouse buttons, and in the center of the keyboard is the orange trackpoint nub. The trim of the notebook is a single band of aluminum with the necessary ports cut out of it, while the bottom is matte plastic. HP continues to use the quick release panel here in the 8570w; slide the lever to the left and the large bottom panel pops off. It's secure but also convenient for servicing the notebook. I continue to be bullish on HP's current enterprise notebook aesthetic. Much as Dell's current desktop workstation line very clearly has a lot of thought put into it regarding both usability and overall looks, the HP enterprise notebooks balance an attractive, professional style with comfort and ease of use. It's very easy to upgrade the internals of the 8570w, although you'll notice the cooling system isn't particularly robust. As you'll see, this is going to turn out to be the notebook's biggest weakness. Introducing the HP EliteBook 8570w Application and Futuremark Performance Introducing the HP EliteBook 8570w In and Around the HP EliteBook 8570w Application and Futuremark Performance Workstation Performance Display, Battery, Noise, and Heat Conclusion: Fifteen Inch DreamColor, But Is It Worth It?